Band trips for high school students include a public performance as the main objective of the trip. Some performance groups travel specifically for adjudicated festivals, which usually occur on the weekends from early April through the end of May. Other bands, orchestras and choral groups schedule performances at notable pubic venues in major cities. The Washington D.C. performance trip is especially rich because it gives students a chance to play in heavily trafficked public venues such as: the Lincoln, Jefferson, or FDR Memorials, the White House ellipse, Union Station or the U.S. Navy Memorial. Student travel groups can also enjoy the many other sites in D.C. and engage in fun entertainment activities. The White House Ellipse is a nice venue for warmer months, where high school bands and orchestras can play outside. The ellipse is a circular driveway that surrounds an open field. Here, many citizens have demonstrated or participated in community functions. This open area of the President’s Park outside the White House is a highly visible location for a performance group to showcase their talent and is available for performance group trips with enough advance notice. Located on the National Mall in Washington D.C., the Lincoln Memorial offers a splendid view and excellent exposure for student performance groups. Also on the National Mall, The Jefferson Memorial was completed in 1943 and it was built to resemble the Roman Pantheon, with a circular colonnaded style of architecture, which Jefferson himself brought to America. He was a true statesman, scholar and architect, among many other distinctions. There is a statue of Jefferson within the memorial, looking out towards the White House. There is also a statue of the five members of the Declaration of Independence drafting committee submitting their report to Congress, and five excerpts from Jefferson’s writing adorn the walls. These snippets encapsulate his main thoughts and philosophies. Both Memorials are iconic American statues celebrating two of the greatest presidents. Also on the National Mall in Washington D.C. is a memorial to one of the greatest Presidents of the United States – Franklin D. Roosevelt. His presidency occurred during the 1930s and the 1940s and spanned the Great Depression and World War II. Despite having polio and being restrained to a wheel chair in later years, Roosevelt’s leadership is renowned and his legacy remains strong. FDR’s statue is cast in a sitting position with a cloak draped around him and his dog is by his side. On the other side of the memorial are men in a bread line waiting for food, signifying the Great Depression. Because the Memorial is outdoors, on the National Mall, it provides a spectacular amount of visibility for student bands and orchestras. Union Station in Washington D.C. has a rich history as one of the major crossroads of America. Opened in 1907 when the Baltimore and Ohio Pittsburgh Express came into the station, Union Station’s construction was eventually completed in 1908. The white granite construction is outstanding and it is embellished with many different images. All of the wood features inside the Station are made from a deep, rich mahogany. In the fall of 1988, Union Station reopened its doors after a restoration project. Student performance groups have the chance to perform in this iconic structure, which still amazes many with its magnificence today. Travelers can take all forms of rail through Union Station: Amtrak, the DC Area Metro, Maryland Rail Commuter Service (MARC) or Virginia Railway Express (VRE). Bus service on all major public transportation lines as well as private bus companies such as Megabus, Bolt and Peter Pan can also be boarded and disembarked from at Union Station. The bustling Station houses restaurants, newsstands and stores and is the location of many special events. The U.S. Navy Memorial was dedicated in 1987, in the 212th year of the Navy’s existence. It is centrally located on Pennsylvania Avenue, between 7th and 9th Streets. This public, outdoor park also has a Naval Heritage Center on site. The Navy Memorial is centrally located and can easily encompass large groups for special events. Student performers will find that a performance at the U.S. Navy Memorial puts them in the heart of the Washington D.C. political district, where Pennsylvania Avenue connects the White House and the Capital. Trip leaders need to plan ahead with a recommended one year to six months advance to schedule a performance trip to Washington D.C. that includes their desired venue. There are numerous details of a performance trip, but it is well worth the effort. Student travel groups need a special tour guide who is experienced in performance tours. Musicians have to carry their instruments for performance tours in Washington D.C. and this may be bit complicated, especially if air travel is involved and airline luggage fees apply. A specialized tour guide will be able to test stage equipment pre-performance and take on other duties associated in organizing this type of student trip. Many high school bands, orchestras or choral groups scheduled to perform in Washington D.C. usually stay four or five days so they have a chance to see the entire Washington D.C. area. Some performance groups will perform in Washington D.C. and take a short trip out to Mount Vernon or Arlington National Cemetery in Virginia. Others may want to explore political sites such as the U.S. Capitol and the White House, or visit the National Archives or see inside the J. Edgar Hoover F.B.I. Building. In the evenings, student performance groups can have fun, related entertainment, such as a stop at the Hard Rock Café or an evening at the Medieval Dinner Theater. There are, of course, numerous other options to add to itineraries such as exploration of the Smithsonian Museums, or a visit to the newly opened Washington Harbor to ride the brand new observation wheel with a view of downtown D.C. There are so many excellent touring sites that student musicians can see while visiting the Washington D.C. area. And, trip highlights may be customized by the trip leader, band director or teacher. Request a quote for student performance trips to Washington D.C. Many student travel groups heading to New York City will visit the new 911 Memorial and Museum. This phenomenal new National 9/11 Memorial is open to the public now and will be visited by many. 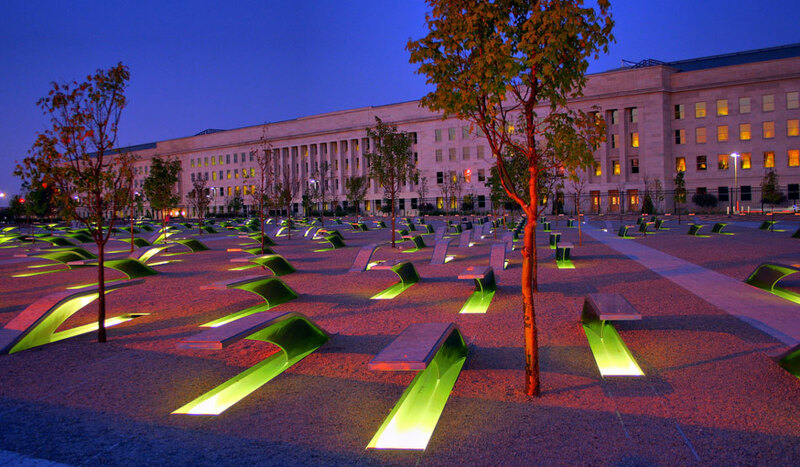 Did you know there is also a National 9/11 Pentagon Memorial in Washington D.C.? The memorial marks the site of the crash of American Airlines Flight 77. The large-scale outdoor memorial illustrates each person’s life with a line that begins with a birth year and ends on September 11, 2001. Prior to seeing the actual memorial, student groups will pass through the Memorial Gateway, where visitors will learn more about the Pentagon, and have time for reflection. On September 11, 2001, American Airlines Flight 77 crashed into the west side of the Pentagon, after being hijacked by five terrorists. All on board Flight 77 died that day and so did nearly one hundred employees of the Pentagon, for a total of 184 people. This section of the building was demolished and reconstructed. The building was created with safer construction features (such as walls and windows that can withstand blasts), and the new design deliberately excludes the escalator that used to connect the Pentagon to the Metro station. The exact position of the memorial is at the point of the plane’s impact that day, and there is even a black stone in the new foundation of the Pentagon, pulled from the demolition, that is inscribed with the date. Each life lost is marked with the year the person was born, with a line extending out towards September 11, 2001. Each memorial culminates in a bench made from marble and stainless steel and is inscribed with the person’s name. The National 911 Memorial at the Pentagon was dedicated in a public ceremony that included the families and loved ones of survivors in 2008, making it the first of the three national memorial sites (including New York City, World Trade Center and Shanksville, Pennsylvania) to be open to the public. The 911 Memorial at the Pentagon is one aspect of the student trip to the Pentagon. Provided there is enough advance planning, student tour groups headed to the Washington D.C. area can visit parts of the Pentagon that are accessible to the public and learn more about the military’s rich history and role in maintaining a democratic nation. Is the Pentagon Accessible for Student Tour Groups? In the post-911 era, procedures and rules when visiting a government building have changed. Despite heightened concerns about security, the Pentagon has done an excellent job of keeping the building open to student group tours. The tour guides at the Pentagon are staff members assigned the duty of conducting tours for a one-year period. Approximately 50 Pentagon employees are assigned the duty of taking students and other types of tour groups throughout this huge facility, and they are imminently qualified to do so. In this age of technological and traditional warfare, the largest military installation in the U.S. is heavily guarded and has special rules for those who attend the 90-minute tours. These tours offer a thorough overview of all branches of the military and a history of commemorative battles fought, so they are well worth it from an educational point of view. For the ROTC student, and for the student thinking of enlisting in the military, a tour of the Pentagon will be fascinating. These students will certainly learn more about the history and battles of their chosen branch of the military. However, if all procedures are not honored by the entire student travel group, students will not be allowed to participate in the Pentagon tour. Just over 100,000 people toured the Pentagon last year, so it is certainly a privilege. Tours can be booked 14-90 days in advance. Trip leaders and teachers need to let a qualified student travel company know of a student group’s intentions to take the Pentagon tour in the planning stages of trip to Washington D.C.
Students cannot carry backpacks or camera bags, and pocketbooks will be subject to search. Electronic devices of any kind are not permitted on tour – including cell phones and smartphones. No food or beverages or tobacco products are allowed on tour, nor are weapons or sharp objects that could be used as weapons permitted. All students on the Pentagon tour must have photo identification to be presented prior to beginning the tour. Making sure each high school student has a proper identification, whether they hold a driver’s license or not, is a detail that needs to be confirmed before students board busses or planes for trips to Washington D.C. It is important that Pentagon staff have an accurate record of persons entering and leaving the building. The most challenging guidelines for today’s tech savvy high school student to observe will be the surrender of cell phones and other electronic devices. This informative tour will include nearly a mile and a half of walking. The immense size of the Pentagon and its history are sure to impress many students. Because it houses leadership of the national defense, the Pentagon is a building that has airs of secrecy and mystery about it. Prior to an actual visit, it is likely many students’ opinions about the Pentagon may have been formed from watching television and movies. Hollywood’s portrayals of Pentagon activities do not always reflect reality. Nor do fictional images of the Pentagon show the initiative, knowledge and skills behind the nearly 23,000 civilian and military employees who work at this complex everyday. Pentagon staff performs an array of duties that are integral to our nation’s defense. By attending a Pentagon Tour, students will come away with more knowledge about warfare, and the way in which U.S. soldiers have distinguished themselves throughout history. After a visit, student’s viewpoint of the Pentagon will be more accurate. To schedule a student trip to Washington D.C. that includes a tour of the Pentagon, visit http://www.educationaltravelconsultants.com. The Washington Monument reopened in May 2014. The NPS is offering extended hours (until 10 p.m.) for visitors who want to take the elevator to the observation deck. The Washington Monument in Washington D.C. has always been a favorite for student travel groups heading to the D.C. area. The obelisk has graced the nation’s capital since the 19th Century – until it was struck by an earthquake on August 22, 2011. Although people were inside and falling debris and stone did affect some visitors, thankfully no staff or tourists were seriously injured or died while visiting the Monument that day. 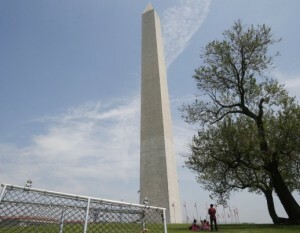 The Washington Monument sustained a great deal of damage from the earthquake. The quake was nearly a 6 on the Richter Scale, with an epicenter 90 miles southwest of D.C., in Virginia. Damages included “cracks, spalls and displacements of stones and joints throughout the building,” according the National Park Service website. The Washington Monument had to be closed to visitors in the interest of public safety. Repair to the Washington Monument has taken nearly three years of labor to aright this structure and make it suitable for visitation. Stones with fissures had to be repaired one by one, and laborers logged over one thousand days of work on the structure. The Washington Monument re-opened May 12, 2014 with a public ceremony, just in time for the late spring and summer travel season. Trip leaders taking student tours to Washington D.C. may now add a visit to the Washington Monument to their itinerary. Built to honor the memory of George Washington, first president, this monument was constructed in two phases: 1848-1854 and 1876-1884. The architect was Robert Mills – and his vision was to place the enormous monument (which would be the tallest in the world at that time) in the center of the green with nothing overshadowing it. Though he originally planned on a 600-foot structure, the actual height was 555 feet, 5.125 inches. It remained the tallest building until the Eiffel Tower overshadowed it. Lt. Col. Casey supervised the latter stages of construction and he revised the height of the structure so the foundational base was strong enough to support it. It is created from the stones of three different quarries: two in Baltimore and one in Massachusetts. Different color stones are noticeable on the Monument. The Army Corps of Engineers completed construction on December 6, 1884 and the Monument was dedicated on February 21, 1885, during James J. Polk’s presidency. New exhibits have opened at the Washington Monument, with more opportunities for learning than ever before. For guided student group tours, teachers and trip leaders are best advised to book tickets well in advance with the assistance of a qualified student travel company. On tour, a ranger will discuss some historical facts for groups as they take the elevator up. Then they will spend some time on the observation deck for a few minutes and descend to the 490’ foot level to view the exhibits. Students re-board the elevator at the 490’ level and while the elevator takes them back down, the ranger will once again point out details about the Monument’s construction and history. For any student of American history, a visit to Washington D.C. and the Washington Monument is a must. Students learn more about George Washington and one of the most awe-inspiring monuments constructed in the world. Visit http://www.educationaltravelconsultants.com to find out more about student trips to Washington D.C.
National Harbor will have a 175 foot observation wheel opening in May 2014. Student travel groups with a destination of Washington D.C. will want to spend some time at The National Harbor (NH). It’s located on the shores of Prince George County, Maryland, just across the Potomac River from Washington D.C. The National Harbor encompasses a stretch of shoreline with magnificent views of Washington D.C. and the many famous structures that dot the skyline of the nation’s capital. National Harbor visitors will have a new treat when they come in the spring of 2014: The Capital Ferris Wheel. Get ready for a ride on an observation wheel that is 175 feet above the Potomac River, providing phenomenal views of downtown Washington D.C. and the surrounding area. This project is a small piece of the National Harbor as a whole, which offers hotels, shopping, dining and entertainment for visitors. While student tour groups may enjoy these activities, some groups may have limited time to further explore the National Harbor – but trip leaders will still want to schedule a ride on the Capital Ferris Wheel. The Capital Ferris Wheel is slated for completion in May, 2014 and will be a great attraction to enhance National Harbor. Initially, developers wanted to build a Disney theme park and resort at National Harbor, but this deal fell through. Now MGM will be building a casino at National Harbor instead, a decision that has left many unhappy. Student travelers and educational travel companies would have benefitted more from a Disney resort than a casino. Yet the harbor itself and the views of D.C. the Capital Wheel provides are reason enough to visit. 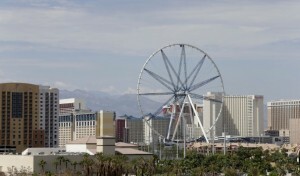 Representatives of the maker of the Capital Wheel, Chance Rides, call it an observation wheel, not a ferris wheel, making an important distinction. Rather than a carnival ride, the Capital Wheel is designed for those who want a long, slow look at landmarks with a bird’s eye view of the Washington D.C. skyline. Each ride allows for two revolutions around the Capital Wheel. Riders see views of the Washington Monument, U.S. Capital, the Pentagon, Alexandria, Virginia and Prince George’s County, Maryland. There are other world-class cities that have observation wheels and these have proven to have great appeal for the public. The idea is to see iconic landmarks in cities like Washington D.C. from a high vantage point. Other cities with wheels include, Seattle, Washington and London, England, among others. The London Eye reaches heights of over 400 feet and surely bedazzles visitors. Up to eight people can be seated in each of the 42 climate controlled gondolas and it can be used year round. Students can ride it anytime between 10 a.m. and 10 p.m., making it convenient to complementary activities in Northern Virginia, such as a visit to Arlington National Cemetery and/or Mount Vernon. On a pleasant spring or fall day, student travel groups will love a visit to the Potomac River waterfront, strolling along the docks of the National Harbor Marina. If there is time for the student tour group, perhaps they can enjoy a lunch or dinner at one of the fine restaurants in National Harbor, too. If time permits, groups may take water taxi rides or even add a sightseeing cruise on the Potomac River to their itinerary. Whatever the plan when visiting National Harbor, consult an educational travel company. Their experts will help to coordinate the trip with visits to many of the other rich historical and cultural sites to visit in the Washington D.C. area. Visit http://www.educationaltravelconsultants.com for more information about student trips to Washington D.C. that include a stop at the National Harbor. 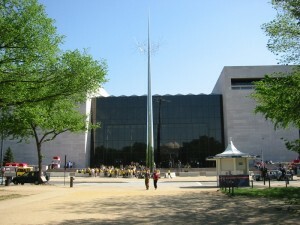 The National Air and Space Museum in Washington D.C. is a popular place for student travel groups to visit. One of the most popular stops on a student tour of Washington D.C. is the National Air and Space Museum, part of the Smithsonian Museums. The Smithsonian Museum is so vast it would be a huge challenge to construct a student group tour of each museum on just a four to five day visit. So, educators and student trip leaders need to be selective about which Smithsonian Museum fit best with curricular objectives. For science, history and social studies students who want to be exposed to the evolution of air and space travel – the National Air and Space Museum is a winning choice. Students learn through contemporary interactive exhibits designed to keep their attention. This overview of the National Air and Space Museum will highlight major parts of it. This is a great snapshot of the Museum’s offerings, so student trip leaders can plan on which places in the Museum and exhibits to include in their visit beforehand. Social studies, history and science teachers may be interested in using educational materials found on the website to prepare students in advance of a student trip to Washington D.C. Visit the Explore and Learn section of the National Air and Space Museum website to download classroom materials. There are so many exhibits to choose from at the Museum in Washington D.C. Some historical exhibits include: Early Flight, Apollo to the Moon and the Barron Hilton Pioneers of Flight Gallery. Exhibits that showcase contemporary technology developed by scientists include: Lunar Exploration Vehicles, Military Unmanned Aerial Vehicles (UAV) and Moving Beyond Earth. These are just a sampling of a long list of extraordinary topics related to air and space. For history students, a focus on specific periods may work best. Many students study the major U.S. conflicts. See World War I; the Pre-1920 Aviation exhibit, which covers this era; and, World War II Aviation spans the 1930s and 1940s. One of the most popular exhibits at the Museum is Spirit & Opportunity: 10 Years Roving Across Mars. This particular exhibit focuses on notable accomplishments of two Mars Rovers and is on exhibit through September 14, 2014. 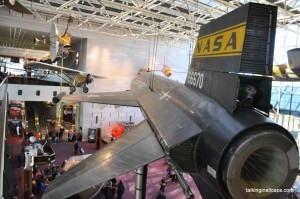 Learn more about other exhibits by visiting: http://www.airandspace.si.edu/exhibitions/mer/. Student groups may have time to catch a show at the Planetarium. Shows last only 25 minutes. Choose from Journey to the Stars, Undiscovered Worlds and What’s New in Space Science. All movies are scheduled at different times during the day, usually in half hour increments. So when student groups visit they may be able to work one movie in. Viewing a show at the IMAX Theater at the National Air and Space Museum will cost extra for the students and chaperones in the group, but it’s well worth $7.50-10 fee. IMAX films are as close to re-creation of reality as possible, heightening sight, sound, and vision for the spectator. Choose an IMAX movie that parallels nicely with classroom activities. These include: Air Racers 3D (Watch Reno Air Races from a pilot’s view), Hubble 3D (Astronauts on a mission to save the Hubble Space Telescope), The Dream is Alive (Space Shuttle simulations), and To Fly! (A journey through the history of flight). On a group visit to the National Air and Space Museum, try to schedule enough time for students to visit the Phoebe Waterman Haas Public Observatory. Access to the Observatory is through the East Terrace. Hours are 12-3 p.m. Wednesday thorough Sunday, weather permitting, so there is a small window of opportunity. The reward is that on clear days students can observe the sun, the moon, and phases of Venus, as well as other sights and phenomenon. For those interested in the development of aircraft and air travel and space exploration, a visit to the National Air and Space Museum is probably the most comprehensive view of the history of U.S. technological advances over the past century – and into the future. This is the type of Museum most students, teachers and chaperones can get excited about visiting. To plan a student trip to Washington D.C. that includes the National Air and Space Museum, visit Educational Travel Consultants website. For Catholic student travel groups, Washington D.C. cathedrals offer some of the most historical and beautiful tourist sites in the nation—and, many say, the world. Washington’s cathedrals are architectural marvels, modeled after the great churches of Europe and comparable to them in grandeur and craftsmanship. Every year, the city’s cathedrals welcome thousands of tourists and student travel groups looking for an historical and spiritually enlightening experience. Below are some of the city’s most awe inspiring and famous buildings. The Basilica of the National Shrine of the Immaculate Conception, built in a magnificent Romanesque-Byzantine style, is one of the ten largest churches in the world, and the largest Roman Catholic Church in the U.S. and North America. Among many other features, it is famous for its brilliantly colored and detailed mosaics, as well as its 70+ oratories and chapels. It also boasts the largest collection of contemporary ecclesiastical art in the world. The Basilica has been visited by countless luminaries over the years, including Mother Teresa and Pope John Paul II. It is open all year round, and offers a wealth of traditional ceremonies for students to experience, including daily masses and ceremonies. The Shrine welcomes thousands of visitors per year, including many student travel groups, and it remains a favorite destination for students from all over the world. Teachers and students can get a preview of the remarkable sights that await them by visiting the Basilica’s official website and taking a virtual tour. Washington National Cathedral has been host to a dazzling array of historical events, including Martin Luther King’s last sermon and Theodore Roosevelt’s 1907 speech, which dovetailed with its opening in the same year. Known as “a spiritual home for the nation,” the cathedral is notable for its exquisite design and interior. There is a sculpture of Darth Vader up in its northwest tower—the result of a children’s sculpture contest sponsored by National Geographic magazine in the Star Wars heyday of the 1980s. A blend of the ancient and the contemporary have made this beautiful structure a fun and popular destination for student travel groups for decades. The cathedral also offers a series of educational programs and lectures. Some of the sessions include meals and discussion. The Italian-Renaissance style Cathedral of St. Matthew the Apostle opened in 1840. Among other things, it is famous for being the site of John F. Kennedy’s funeral in 1963, and contains a plaque memorializing the late president. The cathedral itself is built in the form of a 155 cross, with a dome of 190 feet. The building seats one thousand people and is as renowned for the majesty of its holiday ceremonies as it is for being one of the most sought after tourist destinations in the world. With its large seating capacity, this cathedral is ideal for student travel groups looking to experience the beauty of traditional ceremonies, like the St. Anthony Novena, held on Tuesday evening, and the Miraculous Medal Novena, held on Wednesday evenings. Student travel group leaders can plan a trip that includes a tour of the main cathedrals in Washington D.C. and include a list of other destinations, too. Select from the many museums, galleries, monument tours, and historical sites to add to an itinerary. Student trips focused on government may visit the White House and Capitol if they want to experience the full spectrum of the city’s variety. 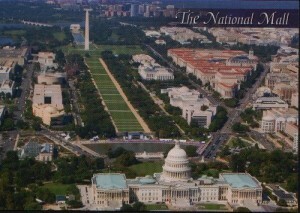 Washington D.C. is the birthplace of the nation. It is also a great place for students to get a feel for the elaborately built and famous cathedrals, built by master craftsman. A cathedral tour can certainly help students connect with religion and help them gain a keen sense of European influence and architecture. 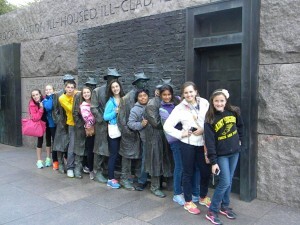 Request a quote for a student tour of Washington D.C.
Students pose in front of the FDR Memorial. Jim Roche, Assistant Principal at St. Eugene Catholic School in Point Fox, WI, recently took his students on a student tour of Washington, DC. The student trip was designed to encompass a wealth of cultural and spiritual landmarks, from the Smithsonian to the famous National Shrine of the Immaculate Conception. Specifically, Roche wanted to give the students a broader picture of American history. He also wanted to encourage classroom spirit and camaraderie. As it turned out, the expedition was an enlightening and enriching experience for the students, and a great success. The backdrop of Washington D.C., with its exciting city landscape, added to the students’ overall enjoyment, and helped to generate curiosity and enthusiasm for learning. When I had the chance to interview Jim, he went over some notable details of the trip. He also talked about how he felt student travel in general had been beneficial to his classes. Q. What is your position at St. Eugene School? Q. When you put this trip together, what was your vision? A. We offered the expedition as an official 8th grade class trip. We’ve been going to Washington D.C. for at least 7 or 8 years, and I think the last 5 or so have been with the travel group we’re using now. Our purpose is twofold: to build unity in the class and to experience the history of our nation. Q. Your group visited many of the major sites, such as the U.S. Capitol, the MLK Memorial, the White House, and the National Archives. How do these sites tie in with your studies? A. The 8th grader studies U.S. History, so the tie-in is perfect. Prior to the trip, the students are asked to research a specific monument or venue and share it with the class. The visit becomes an integral part of their study of U.S. government, as well. Q. You chose to bring your group to the Holocaust Museum. What were students’ reactions to visiting this site? A. Each student has a different reaction. For some, it is a very intense experience, almost overwhelming. For others, it opens their eyes to the Holocaust in ways they’ve never contemplated before. It’s a must-see for us. 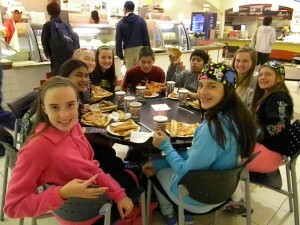 Students have a pizza party when they stop for a break while touring Washington D.C.
Q. Which Smithsonian museums did you visit, and why? A. Each year we go to the Air & Space Museum. The 8th grade studies Astronomy in the spring, so it helps bring to life their study of the Space Program in particular. We also visit the Natural History Museum, and one other museum that the students get to choose. Q. As a Catholic school group, it was probably very important to you to bring the children to a mass in Washington D.C. Why did you choose Basilica of Our Lady of the Immaculate Conception? Can you describe the mass and students’ reaction to having a mass there, as opposed to in their own hometown? A. In prior years, we’d always gone to the Basilica. It’s obviously much different than our own parish. The students attend Mass in the lower level chapel, which provides a unique liturgical experience for them. The whole atmosphere is reverent and rewarding. Q. Describe your visit to the Bureau of Engraving. How did it tie in with educational objectives? What were some of the students’ reactions? A. The Bureau of Engraving has become a student favorite. It doesn’t really tie in to our curriculum directly. It has more to do with their fascination with the U.S. Mint, and seeing all that money in front of them. I think it’s more about the fun than our curriculum, which is fine with me. Q. Your student group used the subway as a form of transportation. How did this impact your trip’s cost? A. We used the Metro because our class size was so small. Normally, we use a chartered bus and stay 20 or so miles outside the city. It worked out fine this year and allowed us an affordable option. If our travel group had not offered the Metro option, we probably could not have afforded the trip, so I’m grateful they were willing to work with us to find a solution. Q. Once they returned to WI and St. Eugene School, were students required to do any post-trip writing or oral presentations? A. Yes, they prepare scrapbooks and presentations, and write about their experiences. But I think the most important aspect is the memories they have of the trip when they go off to high school, and on their separate ways. Q. Overall, how would you describe your tour guide and the experience of traveling? A. They were wonderful to work with. The tour guides have been knowledgeable, friendly, and accommodating to our students’ needs. They’re a big reason why we return each year. The great thing about student travel expeditions is that they can be tailored to fit the interests and focuses of any curriculum. Catholic schools, liberal arts schools, and more traditional schools are all able to work with groups to find or create programs that are right for them. There are no limits to the creative educational possibilities the right trip can provide. Student travel packages have something for everyone, and reflect the diversity and value classroom travel can bring to the school experience. Request a quote for a student trip to Washington D.C. today. Student Travel Groups Heading to Washington D.C.: What’s New? For teachers seeking to provide their students with an invigorating, immersive, and comprehensive exposure to art, culture, history, and just about anything else, Washington D.C. is the place to be. 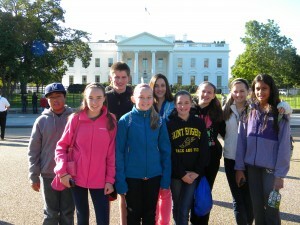 A student trip to Washington D.C. is one of the gold standards of educational travel. Student travel groups have a range of famous landmarks at their fingertips, from Ford’s Theater to Arlington National Cemetery to the Library of Congress to the quaint hustle and bustle of Georgetown. There is something for everyone in this great city, and its liveliness makes for a one-of-a-kind experience that makes learning fun, exciting, and revelatory. For students studying history, the city is nothing short of an invaluable resource. Seeing everything could take weeks. For student tour groups on limited schedules, a focused itinerary for a three or four day tour works best. The list of sites to see is growing now that Washington D.C. has added some new war memorials, a site dedicated to Dr. Martin Luther King, Jr. and a branch of the Smithsonian that focuses on African American History. Students who visit these places will gain a broader understanding of American history. The World War II Memorial, on 17th Street between Constitution and Independence Avenues, is surrounded by the Washington Monument and the Lincoln Memorial, and combines beautiful architecture with many moving testaments to those who participated in one of the 20th century’s greatest epochs. At the crossroads of these three great attractions, students will get an acute and unforgettable sense of the nation’s past. Featuring the famous “Rainbow Pool” and an its mingling fountains, the memorial is open from 9 am until 11:45 pm, and the National Park Service provides guided tours every hour, on the hour, from 10 am -11pm. Teachers can search the computerized World War II registry for information, and use the material to prepare students for this trip with advance lessons in the classroom. The Martin Luther King, Jr. Memorial, at 1964 Independence Avenue on the National Mall is a special address because the street number refers to the Civil Rights Act of 1964. The MLK Memorial is a highly unique structure designed, like all of Washington’s memorials, to draw the spectator into a uniquely “hands-on” historical experience. Students can stroll the grounds, which are flanked by an abundance of cherry blossom trees and crepe myrtles, and read stone-etched inscriptions from the “I Have a Dream” speech. The statue of Dr King itself, as massive and awe-inspiring as the Lincoln Memorial, is almost Egyptian/Sphinxlike in scope. Visiting this new memorial to an American dedicated to the advancement of civil rights is a must for any group studying African American history and its historical and contemporary impact on the world we live in. On the same topic, the Smithsonian Museum of African Natural History just had its groundbreaking ceremony in February of 2012, and is scheduled to officially open in 2013. The Museum of African Natural History has exhibits that are presently housed on the second floor of the National Museum of American History. From their current exhibition, “Slavery at Jefferson’s Monticello: Paradox of Liberty” to their upcoming show, ”The Emancipation Proclamation, 1863 and the March on Washington, 1963” (slated to debut in December 2012), the Museum provides a comprehensive and essential overview of African American life down through the generations, from music to sports to arts and politics. Many have been anticipating the opening of this new Smithsonian Museum where African American culture and tradition is highlighted. Like New York City, Washington D.C. is a city that can be regarded as one of “the crossroads of the world.” There is no end to the varieties of experiences here, whether a student group is touring its many ethnic neighborhoods, dining at a variety of wonderful restaurants, touring the museums, memorials or the Capital and White House, or just steeping themselves in its atmosphere and energy in general. Teachers and student groups have loved the U.S. Capital city for all of its history, government, culture, dining and entertainment and it’s splendid architecture and memorials. Request a Quote for a Student trip to NYC today. For a year leading up to the student Washington D.C. trip, teacher Michelle Rochel prepares her students for the journey in her classroom. She currently teaches 5th and 6th grade Religion, 5th, 6th, 7th and 8th grade Social Studies and Science. She is also the Middle School Coordinator and Dean of Students at Saint Anne Catholic School in Somerset, Wisconsin. For the past ten years, Rochel has been taking her students to Washington D.C. where they can learn firsthand about American history. “I think this is something every child should experience,” said Rochel. “I am grateful for the opportunity to bring them to Washington D.C. and have them be witnesses to history,” she added. The trip enhances their studies of the Declaration of Independence, U.S. presidents and the Holocaust, to name just a few aspects of American history covered. To pay for travel expenses, students and parents engage in fundraising beginning sometimes two years prior to the Washington D.C. trip. “Right now, we are one-fourth of the way towards our fundraising goals,” commented Rochel. One of the most memorable parts of the trip included a visit to the United States Holocaust Memorial Museum. When the group visited the Holocaust Museum, “They were speechless,” recalled Rochel. “In the classroom, we went in depth in our studies of Holocaust victims and survivors. At this museum they could see the human faces that went into these stories. It will be something they never forget.” The powerful, graphic images of mass extermination of the Jewish people and others Hitler deemed outcasts are a great deal to process. The interactive exhibits at the museum as well as personal stories gathered from survivors make the information accessible and the experience authentic. Rochel’s students visited many other places in Washington D.C., including the Smithsonian American and Natural History Museums, the National Archives, Arlington National Cemetery, the Pentagon, the U.S. Capitol Building, the White House Photo Shop, Mount Vernon, the Air and Space Museum and the National Zoo. They also attended mass at the National Shrine of the Immaculate Conception. This ambitious itinerary was well worth it, especially because some of Rochel’s students have never been on an airplane, or to the East Coast. “They return with a deeper appreciation and a better understanding of their own history,” said Rochel. Request a Quote for a student trip to Washington D.C. Or, email an educational travel consultant for more information: info@educationaltravelconsultants.com.